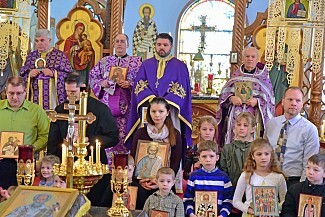 On Sunday March 17, the Sunday of Orthodoxy, the Sunday School children, parents and teachers of St. Nicholas Orthodox Church in Bethlehem, PA, had a procession to the front of the church with their favorite icons, which they brought from home. There, they were greeted by Fr. Matthew Joyner, Fr. James Mason, guest priest Fr. Gregory Dudash and Deacon Geoffrey Lobalbo, each holding their own icons. 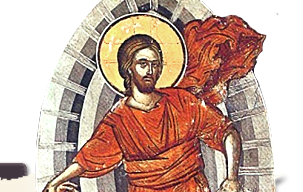 A history was read about icons, and that the church proclaimed icons are to be honored like other material symbols of the church.